I used to think that scheduling was for losers. Life is about being spontaneous! Planning everything out is for boring people. I thought life would be more fun, and it was occasionally, but there would be this lingering feeling inside me that I was just drifting. Without a plan or overarching goal to my days, time would pass by so quick, and looking back a week later, I would be like "Where did the time go?" Do you ever feel like -- even when you're having fun, drinking 4 days a week, partying and just letting loose -- that you're not really fulfilling the person that you were made to be? It's fine (and fun) to do these things on occasion, but overall, if you're not putting in the work to accomplish your dreams, then every beer that you drink becomes depressing. That sick feeling is natural. And it's controlled by the Monkey. 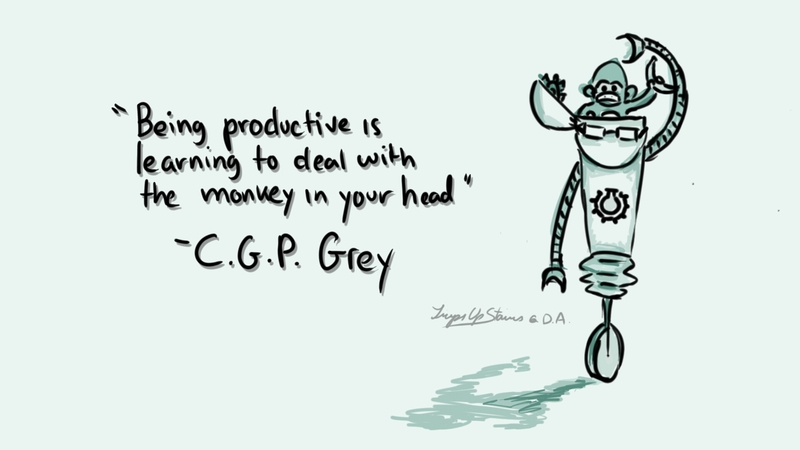 Your unfulfilled potential -- based on your own expectations of yourself -- is saying that you should really write that book, or that you should really find a job, but your the monkey inside your head says "no, let's just play video games today. We can always get that job tomorrow". The Monkey is a vicious creature. Life is long - it's alright to put things off. Netflixing for 8 hours is more important than 4 hours of work and 4 hours of Netflix. It's okay to wait until after college/this job/X happens to start working on your dreams. From the Elise Blaha blog. The Monkey has no choice but to respect the calendar. The calendar tells the Monkey that there is a time and place for it, but that's only when you decide. And it is also not some rigid thing that you have to follow to a T.
A calendar is simply a visual representation of what your ideal day would look like, with the understanding that things pop up and you have to be flexible to those things. What it does is give your day a purpose. Whether that purpose is to get 1% closer to finishing that book you want to write, or 1% closer to learning that song you want to play, the calendar is the way. Even if your goal is to relax and spend time with your family for 8 hours -- that belongs on your calendar as well. In the same way that you schedule your classes, when you calendar things in for your own goals, it's a commitment to yourself. Calendaring is a commitment to honoring who you are, what you want, and how you're going to achieve it. It says that when you schedule in free time, you're going to honor that and NOT WORK ON ANYTHING. It means that when you schedule in time to work out, you honor that commitment to yourself to get in shape and make yourself healthy. Calendaring is not binding yourself to a strict schedule. It's a focused but flexible vision and plan on creating the life that you want to live. Subscribe to my blog newsletter on the right sidebar. I'll be sending more exclusive tips and personal stories on there.